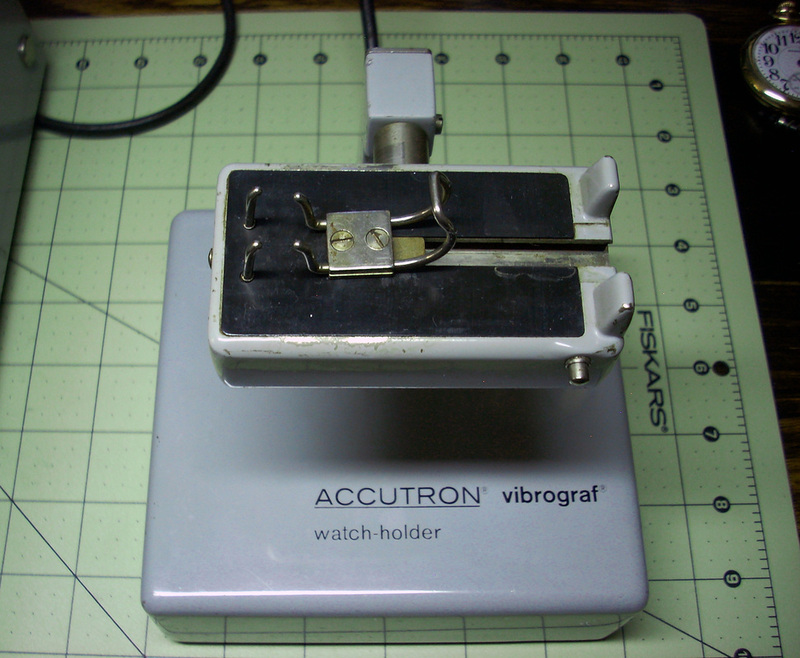 This is the Portescap Diapatest DT 311 watch holder for my Vibrograf B100 timing machine and is designed for checking Bulova Accutron tuning fork watches (and mechanical watches, too). 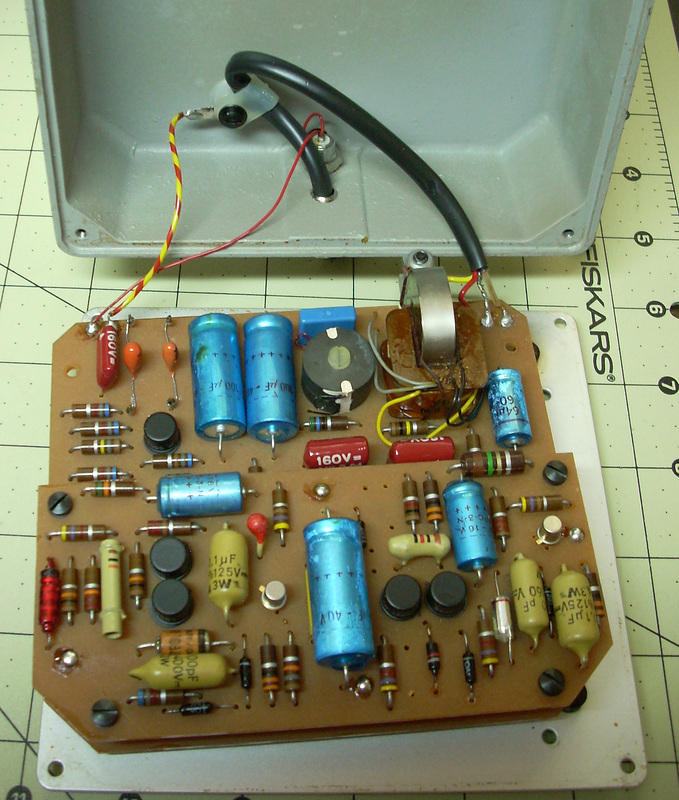 It's transistorized and power is supplied through a RCA phono plug connection to the Vibrograf timing machine. I have two of these watch holders but neither is working, so time to dive in and fix them. 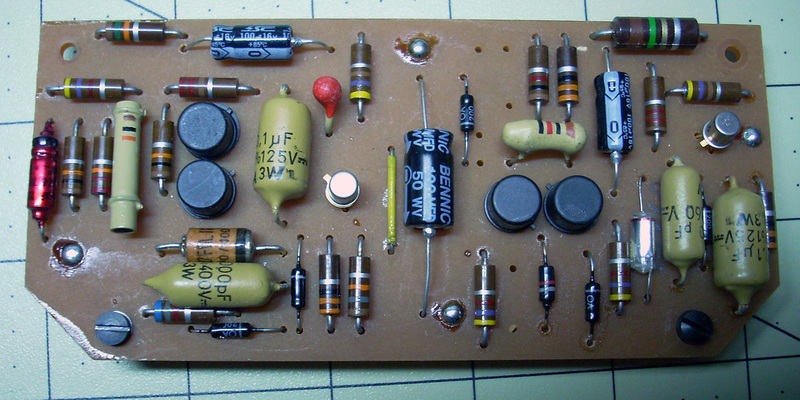 The circuitry located in the bottom of the case consists of a main printed circuit board (PCB) and a daughter board. 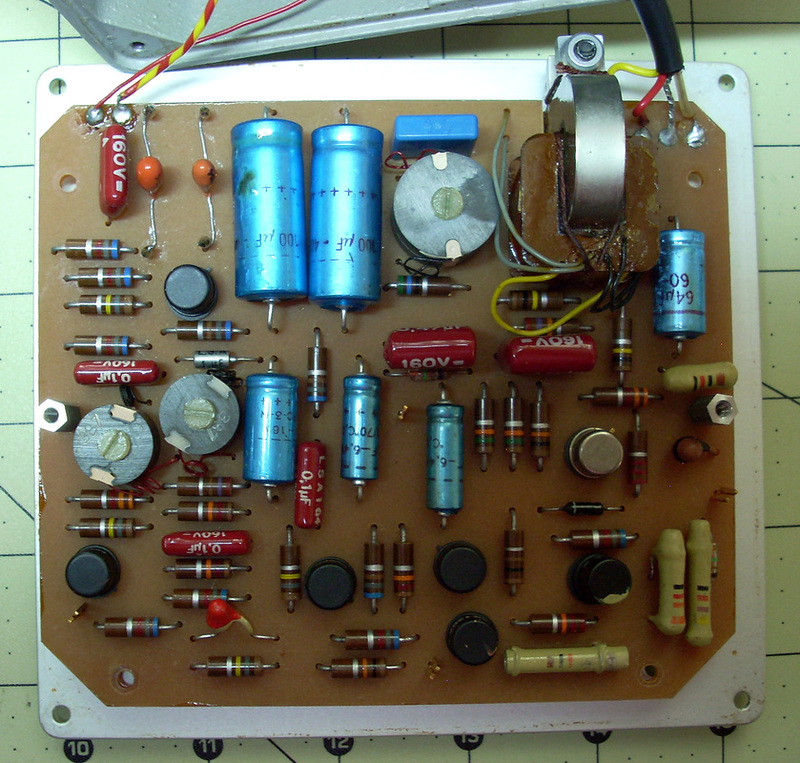 The main circuit board. 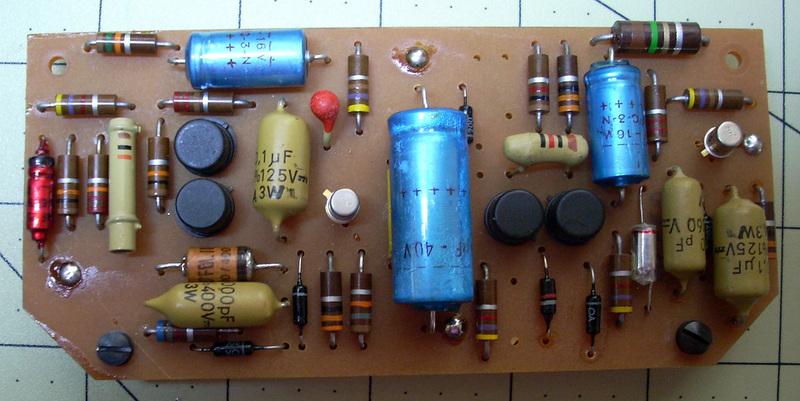 All the old blue electrolytic capacitors need to be replaced: several are visibly corroded. Other components will only be replaced as necessary. 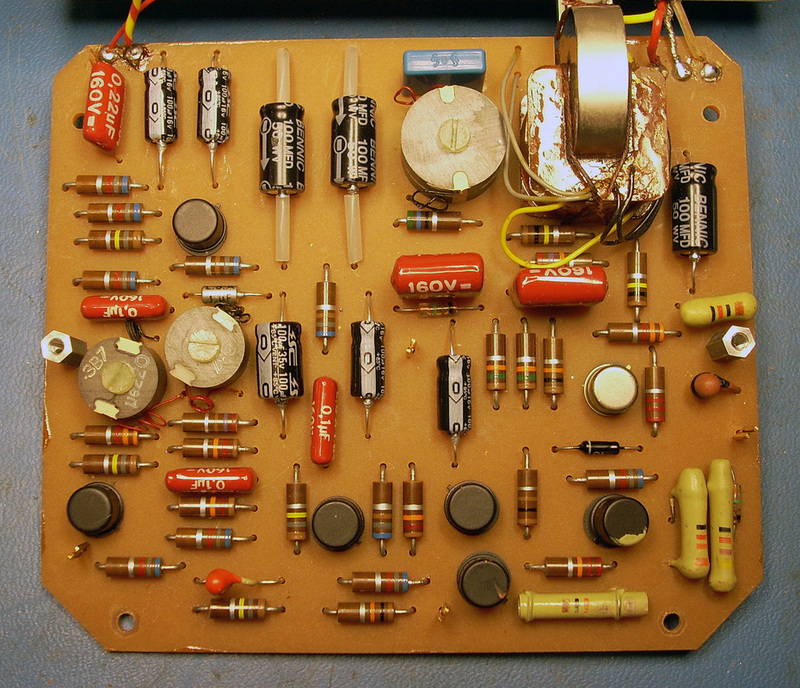 The daughter board removed from the main PCB. Again all the blue electrolytics will be replaced and other components checked. The daughter board after repairs. With this board I get a single line trace when testing Accutrons. The daughter board of the second watch holder has different circuitry. With this daughter board I get a 3-line trace when testing Accutrons. I don't have any documentation on these watch holders so not sure why the difference between them. The main PCB after repairs. This board is the same in both watch holders. 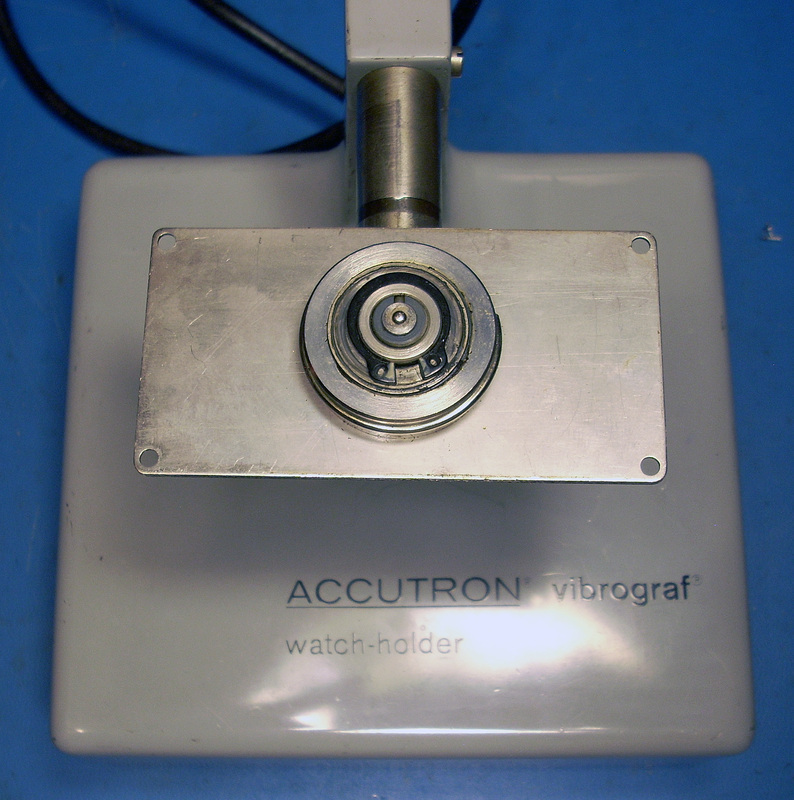 Neither watch holder had connectivity between the PCB and crystal. The cause in both cases was the spring wire that connects the movable head to the base through the arm. It had broken at the rear arm connection. 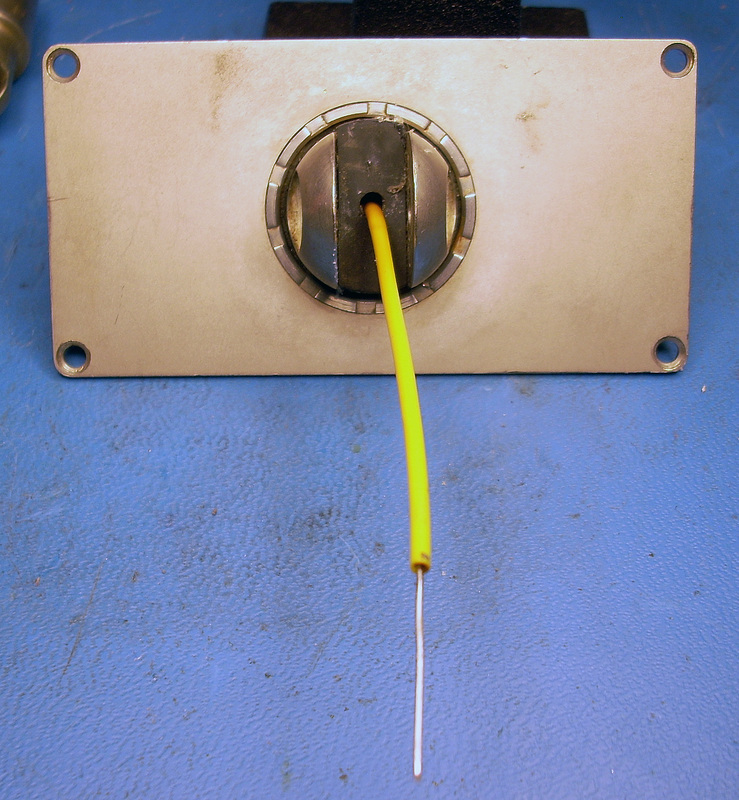 Shown is the spring wire after disassembling the head and pulling off the yellow plastic insulation. 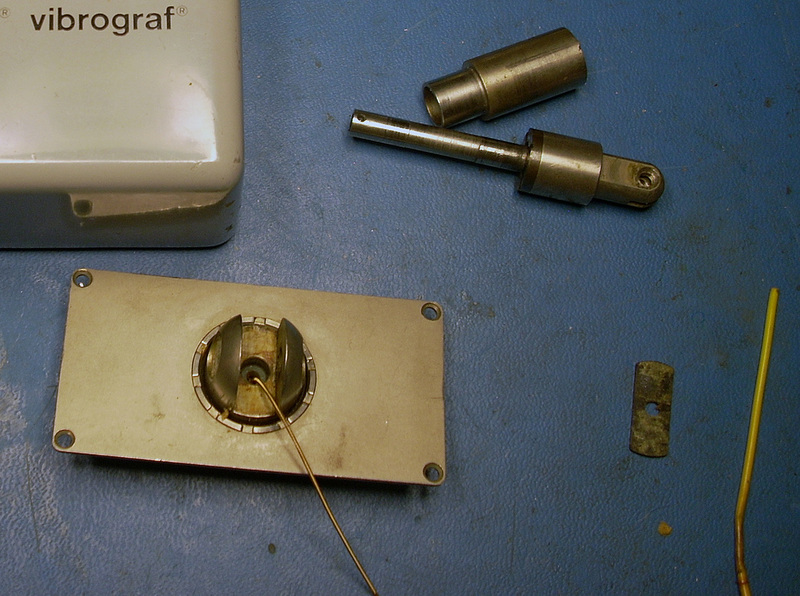 Since the broken spring is now too short I soldered on a wire lead from a capacitor to extend it. The spring wire with the insulating sheath slipped back on. The spring wire slips inside the arm and the wire extension protrudes thru the hole for the center contact. 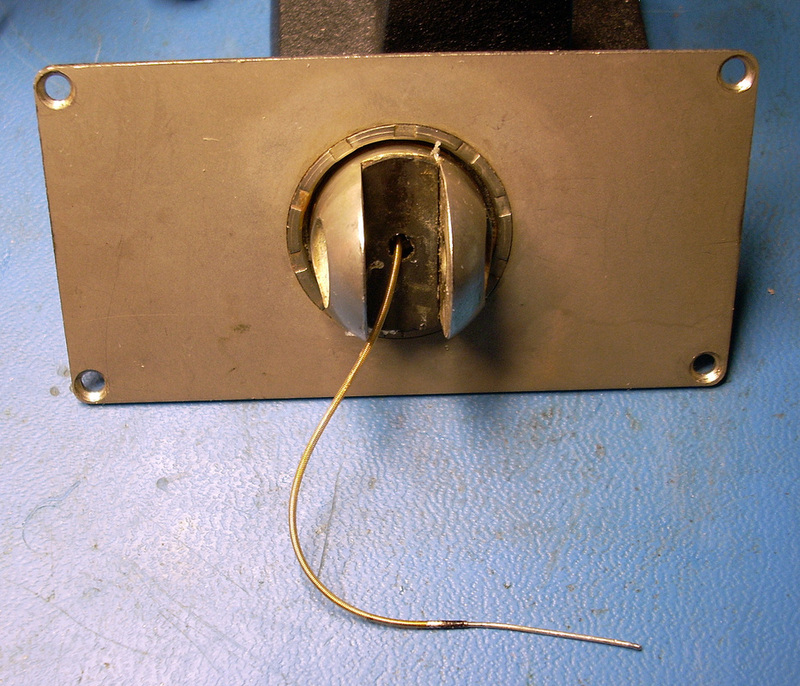 The wire extension was trimmed and soldered to the center contact. 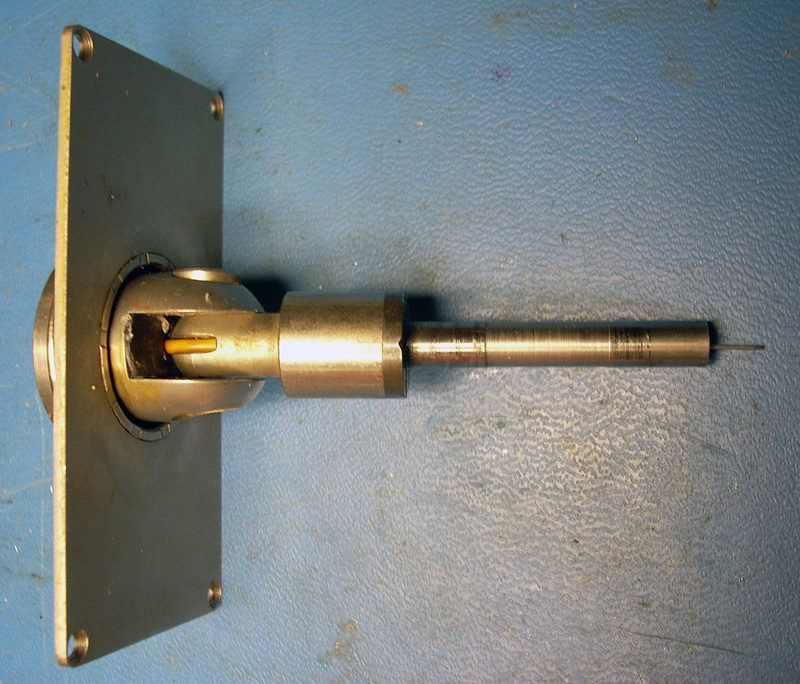 The contact was then pressed back into the shaft as seen in the picture and the arm reassembled. 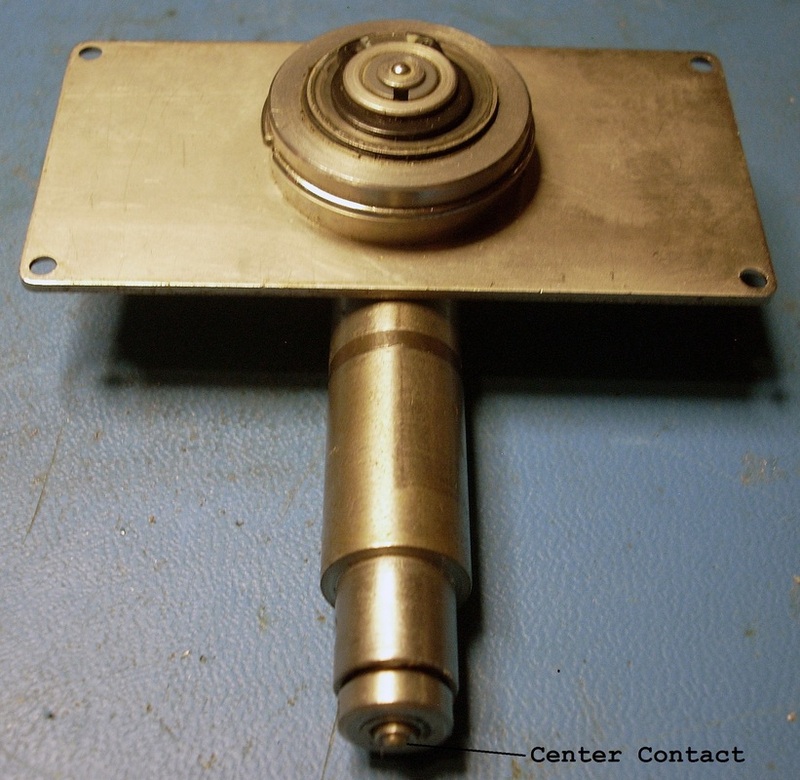 The head minus the crystal assembly with the arm reinstalled in the base. There is now continuity from the center contact of the head down to the PCB.